75′ x 30′ working space. Spacious waiting and crating areas, mezzanine level viewing/lounge area. Flooring is dog and handler friendly Comfort-King Supreme Matting (what is used in Clean Run’s facility). Well lit, high ceilings, washrooms, and heated (12 – 17 degrees) in winter months. 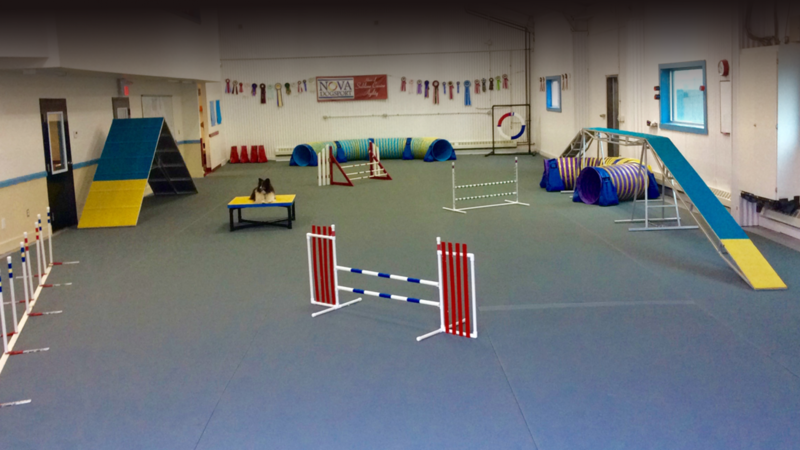 High quality and safe agility equipment. Treats, toys and and other accessories for sale. To book your rental time, check the calendar (link above) for availability and e-mail lindsay@novadogsport.ca or call 902-402-4127 to make last minute bookings. First time renters must pay a $10 lifetime membership fee and sign our Information & Agreement Form (sent via email).